Includes two bonus songs plus new bonus remix! 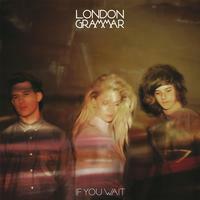 Having already achieved international success, London Grammar — comprised of guitarist Dan Rothman, pianist Dot Major and vocalist Hannah Reid — will release a special U.S. vinyl edition of their stand-out debut album If You Wait. The U.S. Edition of the album will feature two previously unreleased bonus tracks, "Maybe" and "High Life," as well as an exclusive brand new remix of "Strong" by the acclaimed Emile Haynie (Lana Del Rey, Kid Cudi, Bruno Mars, Eminem). If You Wait has seen widespread acclaim since its 2014 release. Pitchfork applauded the album as "a stylish debut that demonstrates both their immense talent and impressive instincts" with Under the Radar noting, "London Grammar deliver their hard-won truths with such an aching sincerity it becomes impossible not to listen." The New York Times also praised the band, observing "Longing, loving, leaving: Those are the boundaries of the impeccable pop universe that London Grammar has built for itself." wow what can i say - stunning recording. first heard it at RMAF in Denver. depth, dark background, deep bass. On The Absolute Sound's Super LP List - which is rare for newer bands. Recommended.